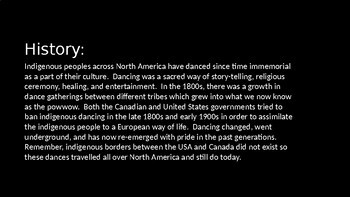 This PowerPoint presentation highlights some of the major dances that have spread across North America including Fancy Dance, Fancy Shawl, Gourd Dance, Grass Dance, Hoop Dance, Jingle Dress, Traditional, Metis Jig, and Inuit Drum Dance. 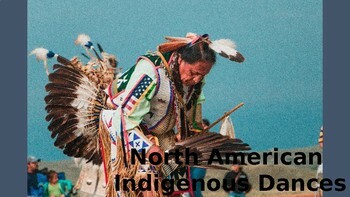 It includes a brief introduction to each dance, regalia, and have accompanying Youtube videos inserted to view each dance. Be sure to enable online content in PowerPoint for the videos to work. 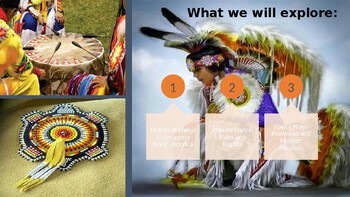 There is also a free handout posted in the store for download if you'd like students to do a quick study of each dance (or one dance) with a model to draw the regalia.